I wasn’t planning on eating out today. I headed towards downtown Grand Rapids to meet a co-worker at the Ledyard Building for a job assignment. I parked on Ottawa Avenue and as I was getting out of my car, I saw a sign that caught my eye. 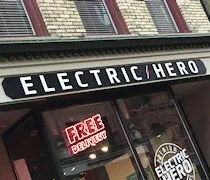 Upon further inspection of this little shop, I found it to be a deli. I like deli’s. I hadn’t eaten lunch yet. I guess I’m going to eat out today. The shop is pretty small with a few tables for dining in and a large open kitchen area. The menu board hangs above the counter. It’s divided like many deli’s menus are in to sections with the different kinds of meats available. I stuck to the beef side of things and ordered the Pow Pow Pastrami sandwich. The only pastrami option on the menu is served on marbled rye bread with provolone, jalapenos, basil pesto (I asked for this to be left off), and a horsey mustard. There are a lot of Boar’s Head advertisements in the building, so I’m lead to believe that’s where the meat comes from. The sandwich cost me a little over $8 and it comes with a pickle slice. There are options for sides which include guacamole and chips, hummus & veggies, and kettle chips, but none are included in the price of the sandwich. It took less than five minutes for my sandwich to be wrapped up and since I still had things to do back at the office, I headed back there. 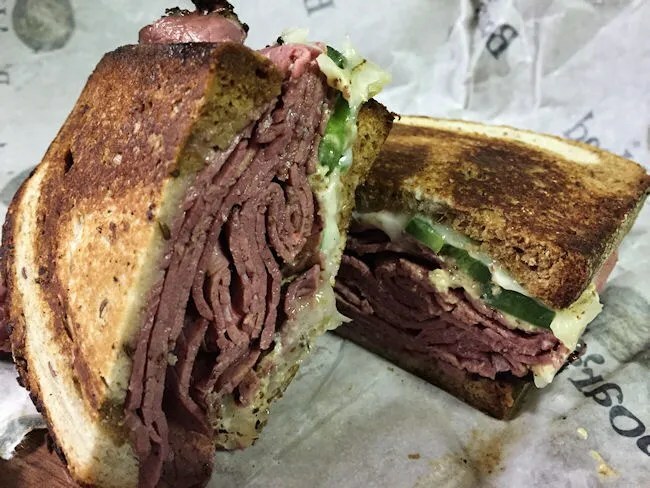 I pulled the sandwich out of the bag and unwrapped it to find a warm, gooey, cheesy, delicious pastrami sandwich. The jalapenos were a bit much as the horsey mustard also had a pretty good kick, so I ended up taking most of them off, but the sandwich was delicious. It was not quite a NY deli style pastrami sandwich stacked to the ceiling, but there was quite a bit of meat between the two slices of bread. 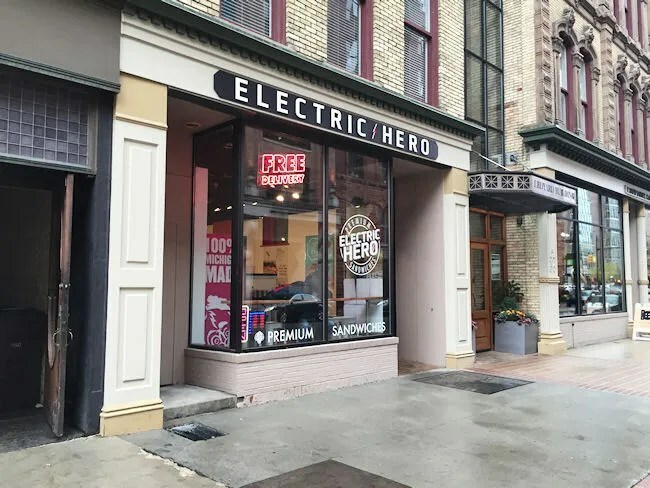 There are a couple of really good delis already in Grand Rapids and The Electric Hero joins them. I always love a good deli sandwich even when the price seems a little high for just a sandwich, but we’re talking about something delicious and that’s really what you need to take in to account when picking a new place for lunch.